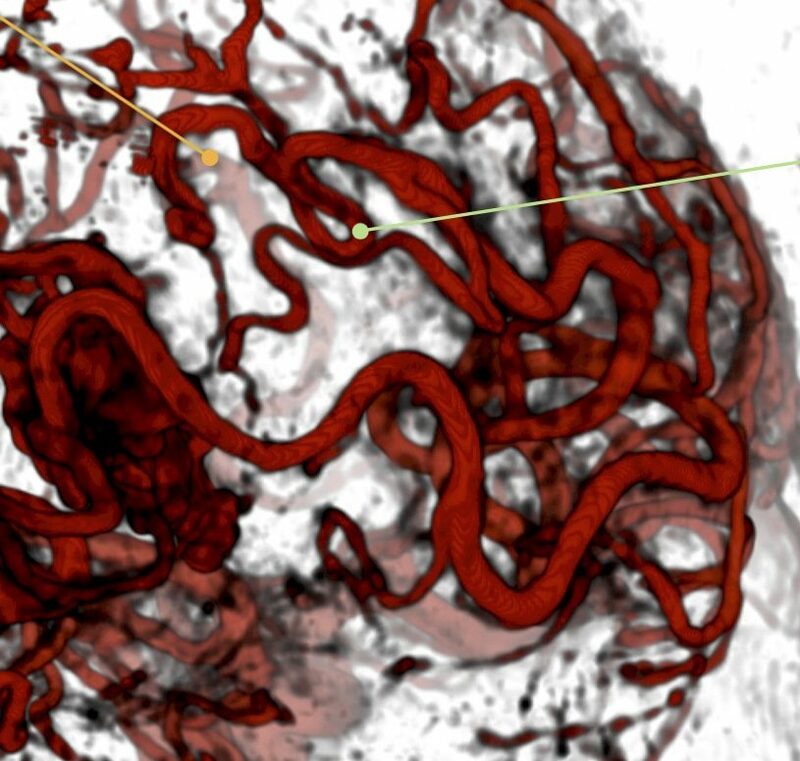 Surgeons make use of cerebral vascular images obtained through angiography for diagnosis, surgical planning and guidance for stenosis, aneurysms and arteriovenous malformations (AVMs). However, cerebral vascular images are often difficult to understand due to the complexity of vessels and furcations which overlap at different depths. An improvement of depth perception of cerebral vasculature, therefore, may help diagnosis, surgical planning, and intra-operative guidance. In this project, we focus on developing new visualization techniques and performing empirical studies that consider the effect of different perceptual cues (stereopsis, fog, chromadepth, and depicting edges) on depth perception of cerebral vascular volumes. M. Kersten-Oertel, S. J. S. Chen, D. L. Collins. An Evaluation of Depth Enhancing Perceptual Cues for Vascular Volume Visualization in Neurosurgery. IEEE TVCG 20(3):391–403, March 2014. M. Kersten-Oertel, S. Drouin, S. J.S. Chen, D. L. Collins. “Volume Visualization for Augmented Reality Neurosurgery.”(Proceedings of MIAR/AE-CAI). Augmented Reality Environments for Medical Imaging and Computer-Assisted Interventions, Lecture Notes in Computer Science, Volume 8090, pp 211–220, 2013. S. J. S. Chen, M. Kersten-Oertel, S. Drouin, and D. L. Collins. “Visualizing the path of blood flow for image guided surgery of cerebral arteriovenous malformations”. SPIE Medical Imaging, San Diego, CA, Feb 4–9, 2012. M. Kersten-Oertel, S. J. S. Chen, D. L. Collins. “A Comparison of Depth Enhancing Perceptual Cues for Vessel Visualization in Neurosurgery.” CARS, June 27–30, 2012. M. Kersten-Oertel, S. J. S. Chen, D. L. Collins. “Enhancing depth perception of volume-rendered angiography data”.VIS 2011 Poster Session, Providence, RI, Oct. 23–38, 2011. Advances in commodity graphics hardware provide new capabilities in the study of stereoscopic volume rendering. In the medical community, volume rendering is used to create 3D anatomical models for diagnostic purposes, surgical planning, and surgical guidance. A digitally reconstructed radiograph (DRR) illumination model can be used to simulate X–ray images. Unlike surface–rendered medical images, however, a volume–rendered DRR lacks depth information. In the thesis work, I studied the use of stereopsis and aerial perspective as depth cues in the human perception of volume–rendered images. Two experiments and one preliminary study were conducted to evaluate the effectiveness of stereopsis and simulated aerial perspective on the depth perception of DRRs. The results of these experiments suggest that both stereopsis and simulated aerial perspective can improve relative depth perception in purely absorptive media. These results provide new ways to visualize complex volumetric data and to explore the capabilities of the human visual system. M. Kersten, J. Stewart, N. Troje, and R. Ellis, “Enhancing Depth Perception in Translucent Volumes”. IEEE TVCG, 12(6):1117–1123, September/October, 2006.